Toyota Hilux Vigo Double Cab is the most demanded and successful vehicle made in Thailand exhibiting a sense of true elegance and reputation with a trendy look for customers. Hilux Double Cab was specifically designed for some actionable and adventurous activities with having a firm hard and robust structure. The name HILUX is an abbreviated form of ‘High Luxury’ which indicates it provides extremely lavishing lifestyle for customers. This popular 4×4 pickup truck was manufactured and designed by Toyota Motor Corporation in the year 1968. The first generation was of simple light commercial vehicle used for passenger and cargo delivery applications. It had an initial model design structure of enclosed front 2 doors cabin with a wide open and spacious rear back for easy carriage of all kinds of cargo stuff for passengers. The Toyota Hilux Vigo champ 2015 come up with a latest trendy look, sturdy and rugged solid exterior design and comfy interior for customers. It is simply perfect and ideal for off-road leisure and fun adventure for everyone. Hilux Vigo Champ is available in versatile different versions most popular and famous in the market. Following are the versions of Hilux Vigo Thailand for more style and innovation for customers. As a symbol of high luxury Toyota Hilux Vigo single cabin brings more toughness and rigidity in pick up design for all terrain entertainment. It consists of superb exterior design with exemplary features like high standard braking systems and well equipped advanced technology interiors including 2 din audio head unit with mp3 player, Bluetooth, Universal Serial Bus and six speakers stereo sound system for passengers. It has an advanced variable nozzle turbo engine design with 2.7 litres gasoline and 2.5 litres diesel fuel capacity. It provides better fuel economy and maximizing power efficiency. It has a 5-speed manual transmission for better speed precision. Double Cabin Hilux Vigo provides a sense of masculinity with durable and robust exterior structure design. The exterior includes 17-inch alloy rim wheel, electronic mirror, adjustable wing mirror and fog light with more enhanced radiator grills, bigger and brighter headlights, 4 doors and five people seating capacity. The interior is designed with extra spacious leather six-way adjustable powered seatings. The interior dashboard is super classy with well-balanced power steering including all innovative features like multi-information display, Anti-lock braking systems, LCD Screen, DVD and Air condition. Toyota Hilux Vigo Smart Cabin is an extremely enhanced, upgraded and smart looking right-hand drive pickup truck vehicle specially designed for driving the passion of daring and exciting off-road journey experience. It has been introduced with entertaining exterior and interior features of stylish front and rear bumpers, front grill, headlights, fog lamp, side mirrors, centrally lock door handles and rain vipers. The interior includes a digital clock, key alarm system, seat belt indicator, Audio 2 in FM Stereo with six speakers sound system, blue tooth device, voice recognition, in-car navigation system, air-conditioning, audio control, electric windows, sun visor, theft detection system. It has 55-speed manual transmission precision with 3.0 litres turbo diesel fuel for sustainable high mileage driving experience for customers. 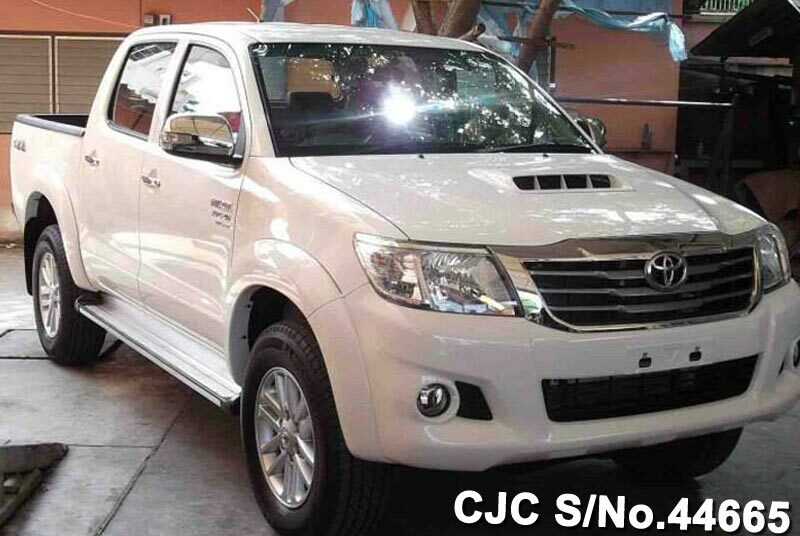 Car Junction is a Japanese new and used car exporter provides Hilux Vigo Champ 2015 for sale at highly competitive prices for customers. We offer satisfied and prompt customer vehicle delivery throughout the world.